These pretty pyrotechnics are immune to status ailments. Use special attacks to win the battle with a bang! The Large Fireworks is a Heartless that appears in Kingdom Hearts χ. It appeared during the Summer event in 2013. The Large Fireworks is very similar in appearance to a regular Festive Fireworks. However, as its name suggests, this Fireworks is larger in size. 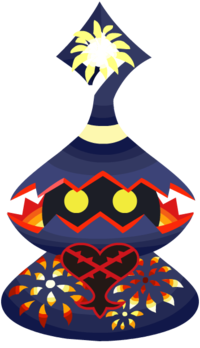 As customary among Heartless of its type, the Large Fireworks has a smooth, conical-shape body. It has two yellow eyes and a dark colored head, which sits inside the fiery, sharp indention its lower half creates. The lower section of its body has a Heartless emblem emblazoned on its chest, and three bright firework explosions. The Large Fireworks's top, conical, hat-like section is also dark blue and has a thick, curled lip, surrounded by several bright bursts as if it were exploding. Across the middle of its hat is a horizontal, tan stripe.